Carolina Meets Cali: One Month Down! Hello my fab readers! I'm starting to think I should have a name for my followers, I never know how to address you. Our Little Big Man started SIXTH grade! It's weird saying that I now have a Middle Schooler now. I didn't even realize it until the summer was almost over, haha. Not only did he go back to school, but he also started playing baseball; which is another WHOA factor for us because he's always been a soccer star. Although, I have to admit that he has done extremely well with adapting to playing different sports, like flag football. I'm so happy that he's been stepping out of his comfort zone and trying different things. He'll always be my soccer MVP, but he's also our all star. On a funny note, it was quite interesting going shopping for his uniform/gear he that he needed. We sounded like two immature little kids just giggling away at the protective cups that they have to wear, lol. I also started working out again. I've been having problems with the number I see on the scale. I miss the "fat" me when I was a tad bit younger compared to how I am now. [the things we take for granted smh] It's all still a learning process for me so I've been doing better at not focusing on that number and not weighing myself as often, as well as focusing on increasing my cardio, eating better, and lifting a little heavier. I was getting so frustrated because I started this journey back in May and my weight would just fluctuate. 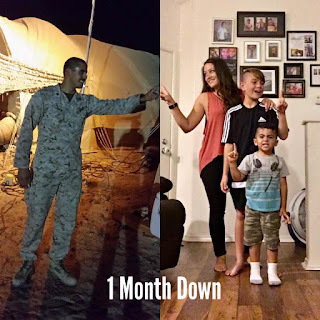 I took about a month off when my family was visiting just because I didn't want to waste their vacation time on me going to/from the gym, and I didn't want to be away from my Husband since he was going to be deploying. [excuses] So for the past month I increased my cardio. I workout 5 days a week and I do cardio every time, but I reserve 2 of those days to strictly focus on it; I used to only do it once a week. I've also started meal prepping. I didn't start this until a couple weeks ago. Seriously - it's pretty convenient. So far I've lost 2 lbs. It's not as much as I'd like, but I think my expectations aren't ideal. It's tough because I'm not always motivated, but I'm trying to stay on it because I have goals in mind I intend to keep. We survived two appointments since he's been gone, haha. I don't know think a lot of people would consider that an accomplishment, but I was seriously stressing out about it. I don't necessarily pamper myself often, so I go and get lash extensions. [girlfriend, it is not cheap!] Normally I would go and my Husband would stay home with the kids, BUT because of obvious reasons that couldn't happen. So I made sure we charged anything and everything, and brought headphones. They were so well-behaved for that whole hour we were there. It felt like a weight had been lifted. I hope it's like that ALL the time [again, not ideal, but a girl can dream uhkay]. Then I had a doctor's appointment and I thought I had no one to watch my Toddler (my Little Big Man was in school). But then I remembered all of those awesome friends that offered to help if I ever needed it, and went from there. It's not easy for me to ask anyone for help, so I was a little anxious about asking. It worked out though we kind of did a kid swap for the day since we both had things to do. I sent my first set of care packages to him. For some odd reason I felt slightly intimidated shipping them out, but the process was a breeze. I was surprised that both of my packages arrived in such a short time frame. Also, FYI USPS offers a kit for this purpose. You call #1-800-610-8734 and ask for a Military Shipping Kit. It includes different sizes of flat rate boxes, blank address to/from stickers, packaging tape, and clear receipt sleeves. Did I mention it's FREE??? Since the largest box in my kit wasn't big enough for the amount of stuff I was shipping, I sent two boxes instead. I filled one with all his new "necessities" and the other I made special by decorating it for his birthday! When he got his packages we were video chatting and this fool opened the birthday box FROM THE SIDE... [there are no words for the look I gave him] haha, but he 'closed' it so he can open it from the top and take in my efforts. I decorated the inside of the flaps with birthday wrapping paper and then made my own birthday banner, so when he lifted the flaps the banner would spread out. I've been trying to make it a habit to get out of the house with the kids - other than for groceries, the gym, and/or sports - so we're not cooped up all day. We go on little frozen yogurt dates and sometimes we actually go out to eat instead of picking something up to just bring home. Although a lot of times it reminds me that he's not here right now. I've had plenty of melt downs since he's left and it hasn't been easy. I haven't "gotten used" to him being away and I will never get used to it. I've only adapted to him being away. With him gone I kind of feel like I'm discovering my independence all over again. Before he came into my life I already did these things by myself. But once I was let go from my job and we moved across the states I grew to be pretty dependent on him. This deployment is just a reminder to me that you should never fully rely on someone else. I don't mean that in a negative way either. I think a lot of military spouses become used to it or comfortable with this life, and tend to forget that we can do the same things that they do. We can fix things when they're broken, take the car to get it's oil changed/tires rotated, pay bills, workout, go grab a drink with your friends, use the grill [I haven't conquered that JUST yet, haha], or make your own decisions. So to whomever needs to hear it, you can be independent and still be a Susie-Homemaker, etc. It's been extremely comforting that we can communicate often. We don't get to video chat often because the quality is usually horrible, so it's usually messages and gifs, haha. The time difference does throw us off a little bit, but we're managing just fine. This deployment opened my eyes at how much we take for granted the things that are right there in front of us; and almost always we end up regretting/missing it once it's gone. I don't want to be one of those people who constantly put things off and then regret it once it's too late. I feel like this deployment brought us closer and I'm glad that it did. He left while we were in a happy place and it's stayed that way since he's been away. I know they say deployments change people, but I didn't know that it happened before they would even leave. I noticed how his mentality kind of changed and for the better. He's already such a laid back guy, but I feel like he's grown to be a little more stern. I was shocked [actually still am] at how he was blown off [more than likely because of lil 'ol me] before he left and how well he handled it. He wasn't pissed off, but it was more of a realization to him that he wasn't a priority to some people, and he'd rather move on than dwell on it [go best friend! that's my best friend!] Seriously, he's better than me because I would of been calling people out left and right. More power to you boo. I am naturally a worry-wart and an over-thinker. My mind is constantly thinking about the next move or the what-ifs so I can't just blow it off; he's my person and he's so far away, and we're told that anything can happen while they're out there. So how can you NOT worry!? So to say I stress out a little would be an understatement. But now I'm to the point that I have a lot of hair falling out and some other stuff going on, so I'm practicing how to WOOSAAAH.